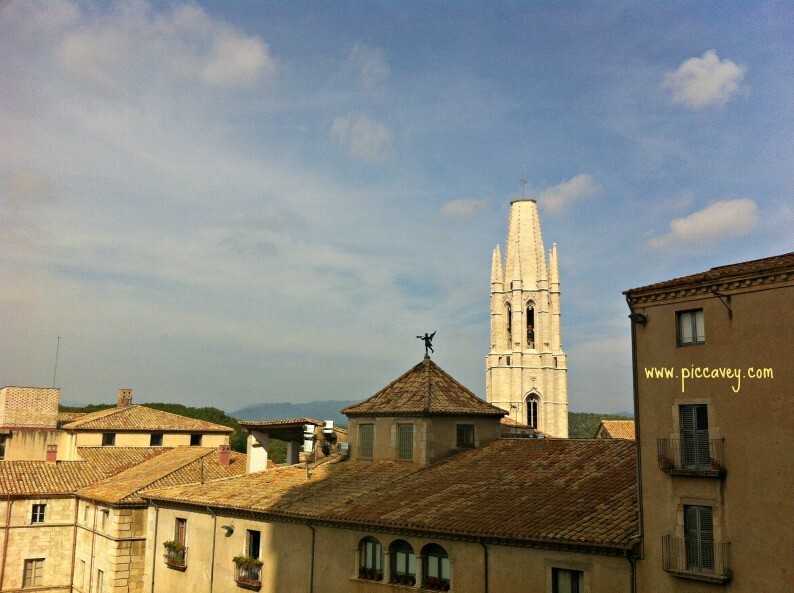 Last Autumn I visited Girona, an historic town, North of Barcelona. Although I´d actually been there before on a short visit, I hadn´t seen much of the place.This time I would be staying for a weekend and hope to discover its catalan charm in more depth. I was happy to find lots of historic buildings, wonderful tiny streets and delicious food in this town. It´s a fabulous place for a weekend break or for a day trip from Barcelona. It´s just 100 kms away from the Catalan capital. Rail links are excellent too. 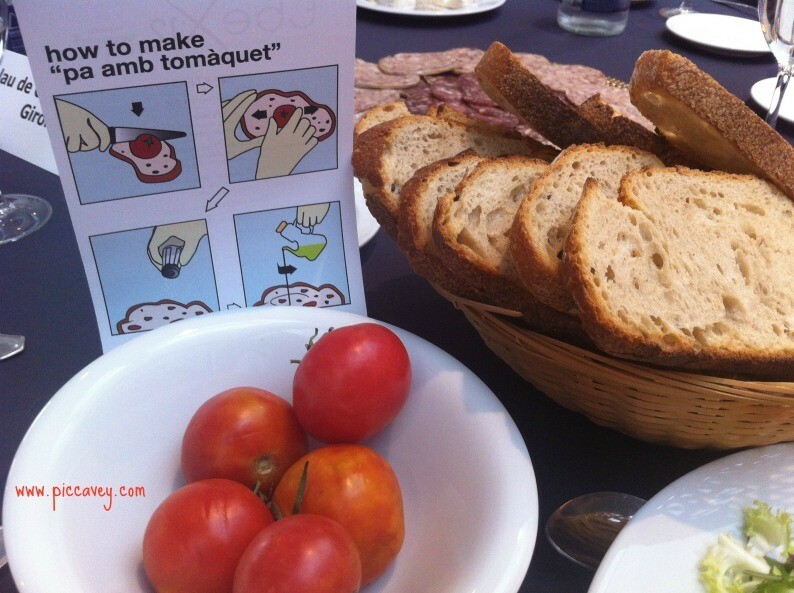 Pan amb tomaquet or Tomato bread (picture above) can be found on any Catalan table. The local rustic bread pan de pagés is so wonderful, it´s easy to spoil your meal filling up on this yummy bread alone. While I was there I took time to catch up with some of my friends who live in the area. They cooked this homemade Fideua (photo above) for Sunday lunch. 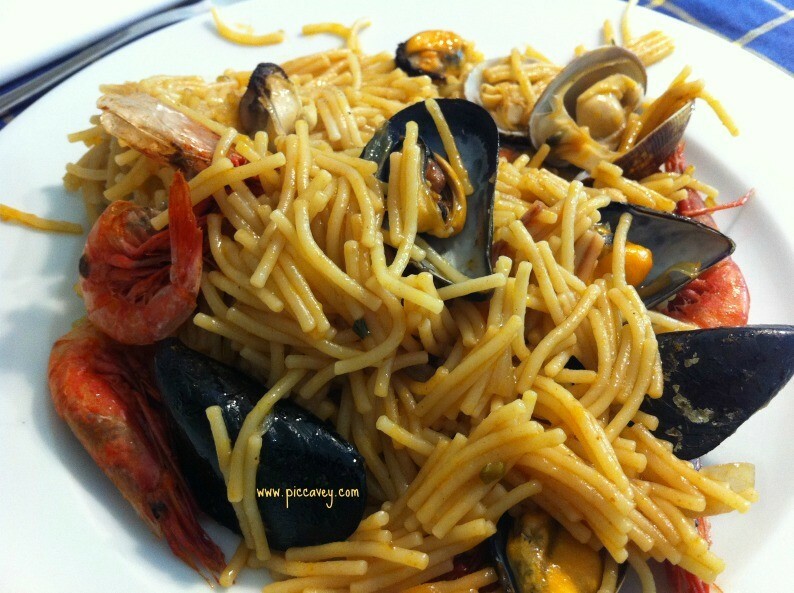 The dish made of fresh seafood, mussels and noodles was carefully prepared for a hearty family feast. Local craft beer from Ullastret was a perfect thirst quencher to accompany lunch. 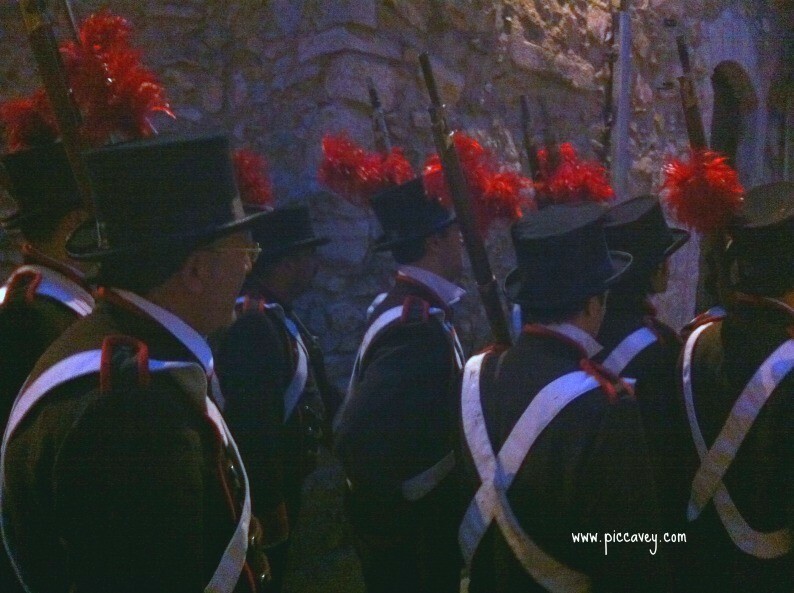 That evening we went to see a renactment of the siege of Girona dating back to the 1809. This battle between the french troops and the local Gironenses fighting to protect their city. 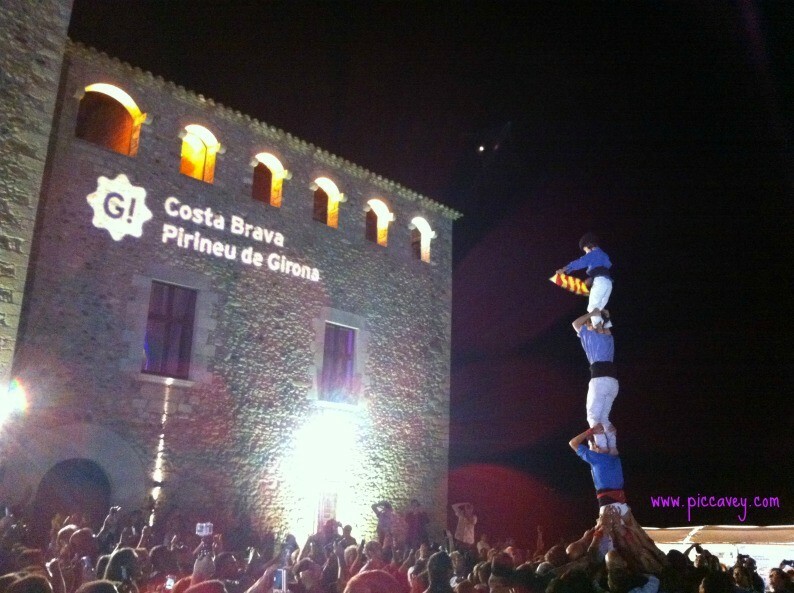 Another Catalan tradition that I got to see that weekend was Castellers (Human castles). I have written a post about Human Towers here . The Castellers often perform at festivals around Catalonia. I have also seen them at Santa Tecla Festival in Tarragona and in Plaza Sant Jaume in Barcelona too. You can find them almost all year round. 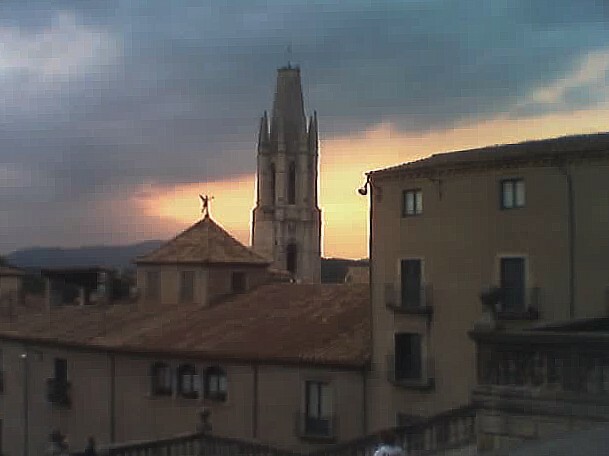 Other sights around the city of Girona as the Church of Sant Feliu and the historic Cathedral. The beautiful stone streets below the cathedral are wonderfully quaint and nice to wander around. One of the month iconic photos in Girona is of the coloured houses on the river Onyar but I enjoyed the old quarter much more. At the end of January Girona celebrates GIRONA 10, a cultural festival with discounted prices in many restaurants and events. A nighttime walk through the old quarter has quite a mysterious and magical feel to it. I found a restaurant to have dinner. Creperie Bretonne. 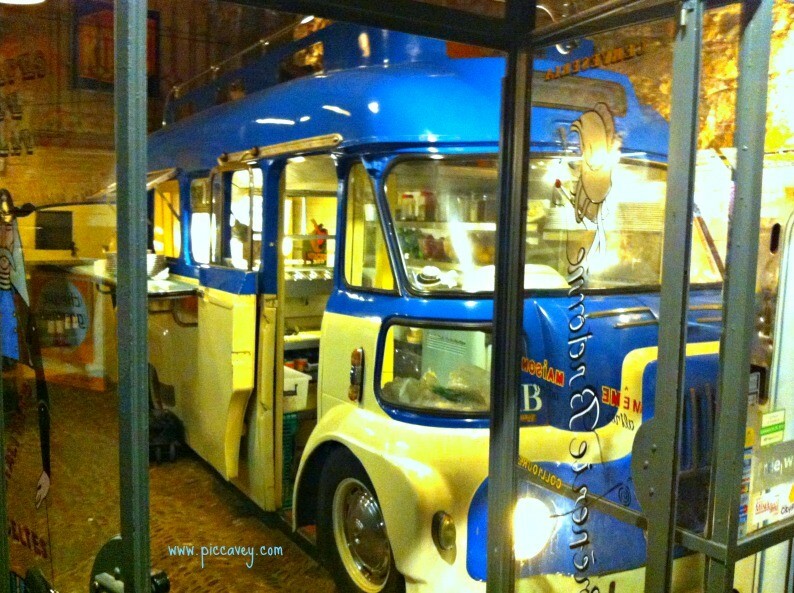 It had a retro decoration throughout with old vintage adverts hanging on its walls and this bus inside. The french influence is clear in Girona. For several years from 1809 the town was under French rule. The geographical location of Girona clearly influences it´s cuisine as well as it´s history. 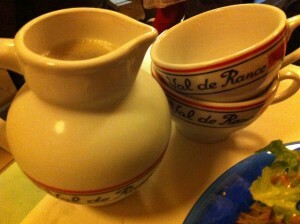 We had a tangy Breton cider to with our delicious savoury crepes. 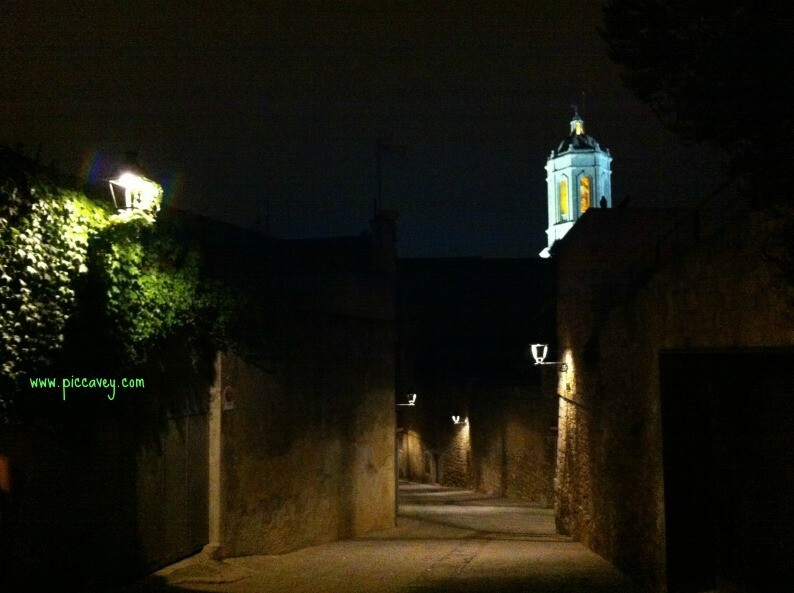 I was pleasantly surprised by the cultural offer and the beauty of Girona. I didn´t expect there to be so much to see and do. My weekend was pretty busy indeed. This is the second article I’ve read about Girona recently, Molly. Most people think of Catalonia as Barcelona and the Costa Brava. If they’ve heard of Girona, it’s because of the airport. Blog posts such as yours though show there’s places beyond Barcelona to explore. And Girona seems the perfect starting point as any. Isn’t there an airport there? Yes. Girona has an International airport. The cercanias local rail connections are excellent from Barcelona & north catalonia too. Nice one Molly. I have never been and would love to go….